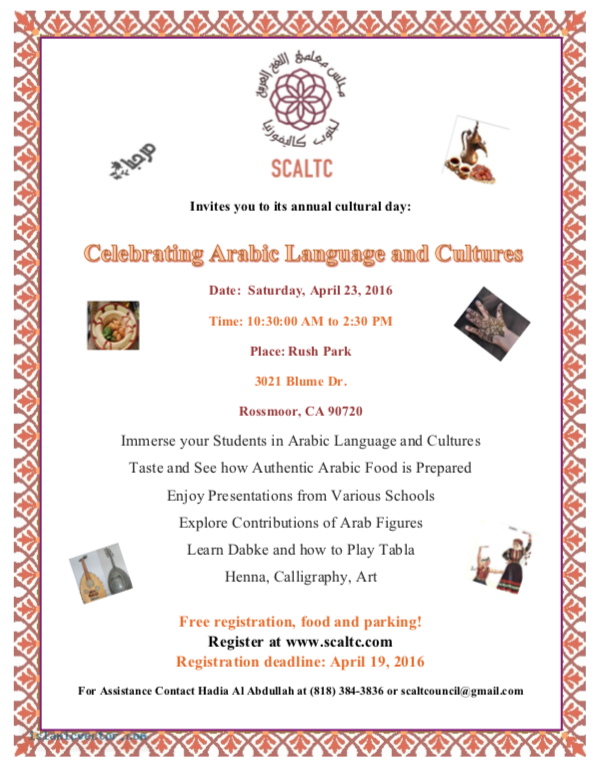 Southern California Arabic Language Teacher Council (SCALTC) invites you to our Third Annual State Wide Conference! Yohiharu Azama, Yoshiharu Azama is originally from Okinawa, Japan and received his B.A. in Music from Showa Academia Musicae in Kanagawa, Japan and M.A. in Education from California State University, Monterey Bay. He has experience in teaching Japanese language and culture at Elementary, Middle, and High School levels over 20 years.He has conducted numerous presentations and seminars regionally and nationally on various topics including; Motivational Curriculum & Syllabus Design, Classroom Management, and Effective use of Technology in World Language Classroom. In 2003, he served as a member of the Instructional Materials Advisory Panel for the California Department of Education.He also has been a recipient of numerous Teaching Excellence Awards. He was named the 2012 ACTFL National Language Teacher of the Year and received Teacher of America Award by Carlston Family Foundation in 2013.His teaching has been featured in the Teaching Foreign Languages K-12 Video Library by WGBH Boston in 2003. http://www.learner.org/channel/libraries/tfl/index.html.He currently teaches Japanese levels 1-AP and is a mentor teacher at North Salinas High School in Salinas, California. He also serves as College Board Advisor for the Japanese Development Committee and has co-written the Pre-AP Japanese Workshop Manual and edited Curriculum Module for AP Japanese teachers. He is also a team leader of the Monterey Bay World Language Project. Fourth annual culture day on Tuesday April 23, 2016 at Rush Park. As usual, we are looking forward for your contributions and participation. This year's event is titled "Celebrating Arabic Language and Cultures". Our next event of the year will be The Full Day Workshop on October 8, 2016 at Occidental collage. As usual, we are looking forward for your contributions and participation.